The world changing events brought on by World War I continued to unfold at a rapid pace in 1917. The United States declared war on Germany in April 1917, the first U.S. troops arrived in France in June. Mutiny became a problem that vexed the struggling French Army. In the Middle East, British forces captured Baghdad. Large battles were fought on the Western Front, including Arras, the Neville offensive, Messines Ridge, the third battle of Ypres. In the south, fighting raged in Northern Italy. The belligerents who found it so easy to glide into war in 1914, found themselves trapped in endless combat with high casualties, growing economic hardship and for some, the waning support of their populations. In the east, Russia, a vast and backward country, was a participant in the Allied war effort. It was also the first of the belligerents to fracture apart under the terrible strains imposed by the war. In March 1917, the riots and strikes that began in Petrograd (St. Petersburg) toppled the government and resulted in the abdication of Tsar Nicolas II. A Provisional Government headed by Alexander Kerensky replaced the failed Tsarist regime. The Kerensky government decided to keep Russia active in the war, fighting on the side of the Allied powers. On the other side, the desperate Germans had a military goal. They wanted to topple the Russian government and get Russia to withdraw from the war. The German general staff planned to undermine the Russian war effort by returning the anti-war political agitator, Vladimir Lenin, to Russia. In what would turn out to be a political blunder of historic dimensions, the Germans decided to implement and finance the scheme. Lenin was an extremely hard case. He had been jailed for one year in 1895 then exiled to Siberia for three years. A dedicated Communist and a bitter foe of the Russian government, Lenin was living in exile in Western Europe when the war began. Lenin had opposed Russia’s entry into the war because it was a conflict between the capitalist imperial powers. If given the chance, Lenin wanted to eradicate the last vestiges of the hated Russian autocracy and destroy the newly rising democratic socialist state headed by Alexander Kerensky. With the Germans clandestinely supporting the trip, Lenin departed from Zurich, Switzerland on a sealed train. It was the beginning of an eight day rail journey across Germany, Sweden and what is now modern Finland. He and his group of approximately 30 fellow travelers arrived at the railroad station in Petrograd, Russia in early April 1917. Upon arrival in Russia, Lenin began his effort to bring the Bolsheviks to power as he struggled to change the direction of the Russian revolution. Unfortunately for the Provisional Government, the war effort war had continued to meet with failure on the battlefield. The country was beset by political unrest, strikes, shortages and military desertions. Lenin’s Communist philosophy, his promise to end the war and provide “Peace, Land and Bread” gained more adherents as the chaos increased. 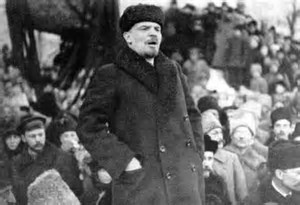 In early November 1917, Vladimir Lenin and Leon Trotsky managed the revolt that overthrew the Provisional Government and led to the establishment of a Marxist dictatorship. The Linin government signed an armistice on Eastern Front in December 1917. 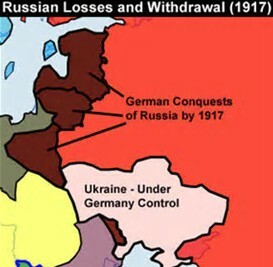 This was followed by the peace treaty of Brest-Litovsk in March 1918. The culmination of fighting in the east released 44 German divisions for redeployment to other fronts. Lenin and Trotsky then turned to the job of consolidating their control over Russia’s large territory. 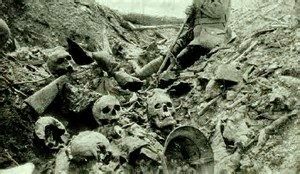 In the Russian civil war that raged from 1918 to 1922, the country sustained an estimated 7 to 12 million casualties. The end result was the emergence of the Soviet Union, a fearsome creation that played a major role in world affairs until it collapsed in 1991. While all the long-term consequences stemming from the ominous 1917 train trip have yet to play out, remember that it began in an almost forgotten war a hundred years ago.